Turkish President Recep Tayyip Erdogan will no longer be able to purchase hundreds of handguns from the US after his bodyguards violently attacked protesters in Washington, DC months ago. The US Department of State has withdrawn a proposal that would have allowed Erdogan's bodyguards to buy $1.2 million worth of firearms and ammunition from the US, the Associated Press reported Monday. The proposed deal was canceled in the months after Erdogan's security guards were filmed beating pro-Kurdish protesters during the Turkish president’s visit to Washington, DC in May. On May 16, more than two dozen protesters gathered outside of the Turkish ambassador’s residence in Washington, DC to voice their opposition to Turkish government policies. 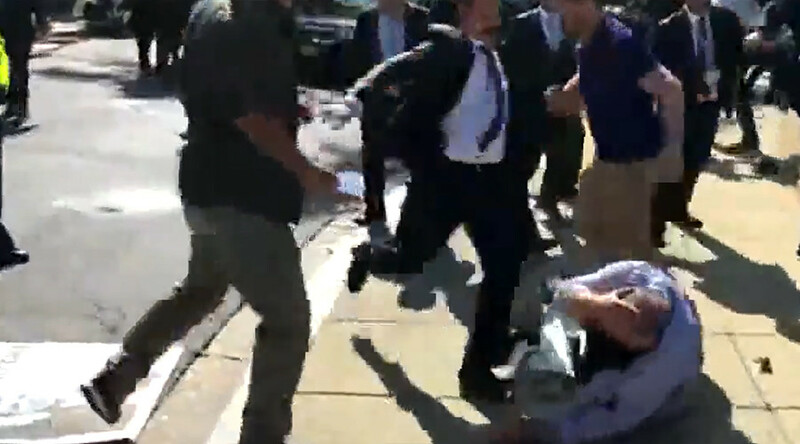 Suddenly, several pro-Erdogan supporters and other individuals from the Turkish Embassy pushed past DC Metropolitan Police to beat, kick and choke unarmed demonstrators. At least 11 were left injured from the attack, nine of whom were hospitalized. The State Department formally withdrew the planned sale at the request of Sig Sauer, according to the Associated Press. The firearms manufacturer reportedly pulled its request for a license from the US government, which is necessary to export weapons, after learning that the Turkish guards did not expect to purchase the weapons. The decision to cancel the deal received praise from Congress, where Republican and Democrat lawmakers have demanded Erdogan’s bodyguards be punished for their actions. Senator Chris Van Hollen (D-Maryland) said the State Department has sent “an important message” by ending the deal. “We're not going to let Erdogan’s bodyguards attack peaceful American protesters - and we’re certainly not going to sell them weapons to do it,” Hollen said in a statement Monday. We're not going to let Erdogan’s bodyguards attack peaceful American protesters—and we’re certainly not going to sell them weapons to do it. “This withdrawal finally points a finger in Erdogan’s chest and tells him a strategic location does not place Turkey above the law,” Trott said in a statement Monday. In May, the House unanimously passed a bipartisan resolution, condemning the attack and calling on the State Department to take measures to prevent similar incidents in the future. In August, 19 people were indicted on a charge of conspiracy to commit a crime of violence, including 15 of Erdogan’s bodyguards, according to Reuters. The State Department withdrew the sale as Presidents Donald Trump and Erdogan both arrived in New York for the annual UN General Assembly gathering Monday.